Is your credit score too impersonal to assess the risk you present? We use credit scores every day providing them free to you in our mobile app and home banking platforms. They are very important to us as well as to banks, credit card providers, insurance companies and in many other areas of life. But it can be an impersonal way to do business if used on its own. So Finex Credit Union has adapted our personal service approach to use credit scores in lending; but only with other facts we have about you to provide a more accurate picture. Here are some illustrations. Young adults start out with a credit score of 0. With most financial institutions this makes it almost impossible to get a loan or to build credit. Finex takes the approach that if you build a checking relationship with us, we will help you build your credit from 0. We do loans individually without cosigners starting at middle range pricing which is considered “C” credit. 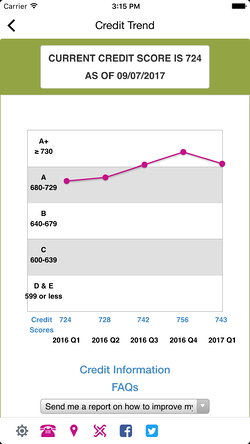 These are reasonable rates for young members who then can successfully build their credit rating and follow their progress right on our mobile app which maps your credit score trend over the past year. For members with a credit history, we always look not only at the score but at the relationship you have built with us. If you rely on us and have a good purpose in mind, we feel more of an obligation to help you beyond what other financial institutions do. Using these factors and others we can keep a personal in the lending area. But make no mistake, if you do not pay your bills, it does matter. In obtaining your first car loan or your first home mortgage I cannot overstate how important your credit rating is. It is the basis for determining the price you will pay and whether you get approved with few exceptions. It can save you or cost you thousands of dollars! That is why Finex provides both information on how to improve your score and importantly the actual tools you will need to do it. There are many places that can do one of these, but very few places that can do both as we do. So, if you have made mistakes we are the place that can help you rebound to get that car you need or that home you have dreamed of. And if you have a great score you will get great rates. We take this personal approach to local lending (even using scores) while most other lenders do not. When members have a good purpose, and have shown good intent we are able to provide in house portfolio loans. Other lenders can only grant loans based on strict credit score criteria. So, expect us to be there with you on a personal level.